Background: Rheumatoid Arthritis (RA) is a chronic inflammatory and autoimmune disease leading to bones and joints destruction. It is one of the major causes of lifetime disability and mortality among humans in the developing and developed countries. It was evident that epigenetic dysregulation is related to the pathogenesis of RA. MicroRNAs (miRNAs) are small non-coding RNAs that are epigenetic regulators for diverse biological processes and also provided novel molecular insights in the formation of arthritis. Objective: The influences of miRNAs in the alteration of gene regulation during the pathogenesis of arthritis were exposed in recent years. Method: The computational approach to identify miRNA through EST-based homology is more powerful, economical and time-efficient. In this study, we applied EST-based homology search to identify miRNAs responsible for the development of arthritis in human beings. Results: Our study on 36519 ESTs in human RA condition revealed the expression of four miRNAs, HSA-miR-198, HSA-miR-4647, has-miR-7167-5p and has-miR-7167-3p. The present study is the first report about has-miR-7167 that was homologous to Macaca mulatta. Conclusion: The predicted targets of these identified miRNAs revealed many biological functions in the pathogenesis of RA. Further elaborated studies on these miRNAs will help to understand their function in the development of RA and the use of miRNAs as therapeutic targets in the future. Keywords: Arthritis, EST, human, miRNA target, autoimmune, joints. 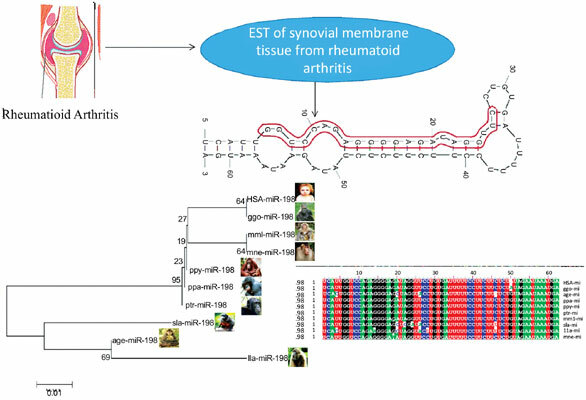 Keywords:Arthritis, EST, human, miRNA target, autoimmune, joints. Abstract:Background: Rheumatoid Arthritis (RA) is a chronic inflammatory and autoimmune disease leading to bones and joints destruction. It is one of the major causes of lifetime disability and mortality among humans in the developing and developed countries. It was evident that epigenetic dysregulation is related to the pathogenesis of RA. MicroRNAs (miRNAs) are small non-coding RNAs that are epigenetic regulators for diverse biological processes and also provided novel molecular insights in the formation of arthritis.